Determine if you will use leads. Set up lead assignment rules. Leads are people and companies that you’ve identified as potential customers. You find leads in a number of ways. Many of your leads might be referred to you by your other happy customers. You might also gather leads when customers contact you on your website, stop by your booth at a conference, or through information exchanges with partner companies. In Salesforce, information about leads is stored in Lead records. At the trade show, you talk to Aparna Bosu. She works at Get Cloudy Consulting West and communicates regularly with Leung Chan. Leung told her about their plan to get custom shoes for the big conference in San Francisco. Aparna’s also interested, and you get her business card. When you get back to the office—or when you have a spare minute with your mobile phone—you enter her information in Salesforce as a lead. You’ll follow up with her after the trade show. You don’t have to use leads, but there are some big advantages to using them, like knowing what’s in your pipeline and focusing your energy on the right deals. You can better track, report on, and target marketing campaigns to prospective customers. Leads may help you concentrate on the potential deals most likely to close. They also help executives maintain visibility and help on key deals. If your company has separate sales teams for prospective customers and existing customers, using leads helps everyone work more efficiently. To control the quality of account and contact data, some organizations only permit accounts and contacts to be created from qualified leads. If everything is an opportunity, you must use the early stages, like qualification, to segment your unqualified opportunities. Enter the first and last name of the lead. If the lead works for a company, enter the company’s name in the Company field. If the lead is an individual consumer, leave the Company field blank. Select a status for the lead. Enter any other information you have available. 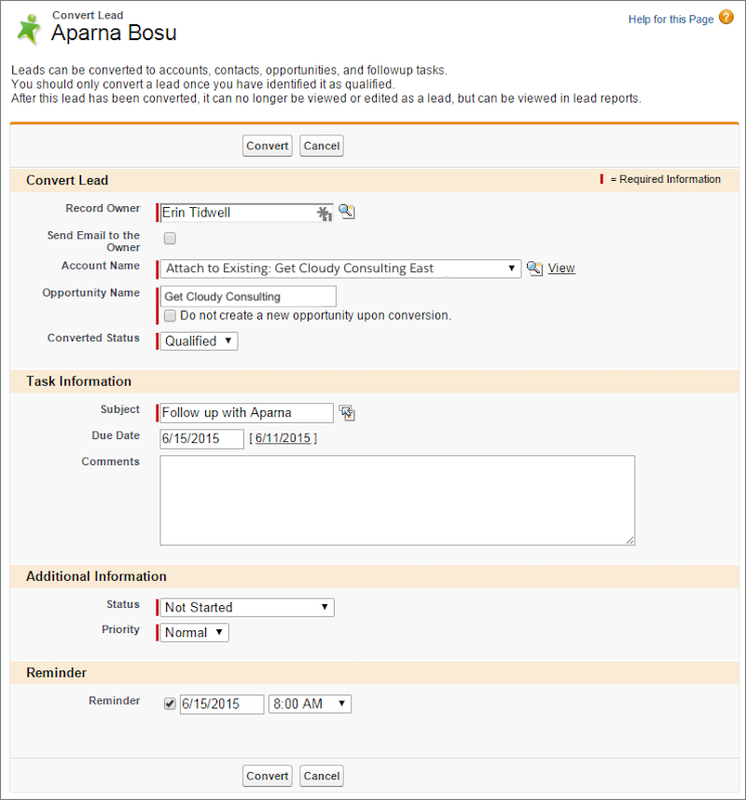 To have the lead automatically assigned using lead assignment rules, select Assign using active assignment rule. Save your users time by customizing the page layout to select this option by default. You can also add leads by importing a file into Salesforce or through an automatic process, such as a Web-to-Lead form that collects leads from your business website. It’s more efficient to set up Salesforce to assign leads to the right owners based on criteria, such as where the lead is located, which industry they’re involved in, or the type of products they’re interested in. For example, suppose you have a sales rep, Dan Lang, who handles all sales for companies in the entertainment industry. To have leads assigned to Dan as soon as they’re entered, create a lead assignment rule called Entertainment Leads with the criteria that all lead records with “Entertainment” in the field “Industry” are assigned to Dan Lang. Before setting up lead assignment rules for your company, you should carefully review your existing business process to determine how leads should be assigned. After leads have been assigned according to your process, be sure to include a catch-all assignment rule to catch any leads who don’t somehow qualify for any other rules. From Setup, enter Assignment Rules in the Quick Find box, then select Lead Assignment Rules. Click Active to turn the lead rule on immediately. In the Rule Entries area, click New. Enter a sort order for the rule. For example, to process this rule before all other lead assignment rules, enter 1. 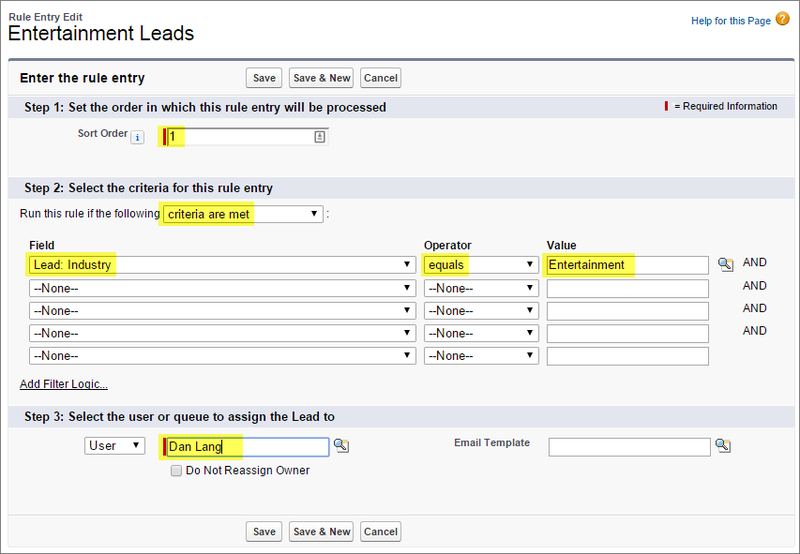 To create a criteria-based lead assignment rule, select criteria are met. Select a field, operator, and value. To assign all entertainment industry leads to Dan, select the field Lead: Industry, the operator equals, and the value Entertainment. Use the lookup icon to find the user to which to assign the lead. If you haven’t created any other users in your Salesforce organization, you can’t select a user. When you qualify a lead, you can convert the lead record into an opportunity. You then work your opportunity until you close the deal by either completing it or canceling it. Qualifying a lead indicates that you believe the lead has a use for and interest in your products, and that a sale is a definite possibility. Some businesses choose to qualify leads more quickly than others. The exact criteria for qualifying and converting leads are part of your company’s unique business process. Suppose that you call Aparna at Get Cloudy Consulting West to talk about her deal. She likes what you tell her, and you’re sure she has a genuine interest in your product. Your lead is ready to be converted to an opportunity. When you convert a lead, Salesforce uses the information stored in the lead record to create a business account, a contact, and an opportunity. If you’ve enabled person accounts and the lead record didn’t include a company name, the lead is converted into a person account and an opportunity. On the Leads tab, select a lead to convert. In the Account Name field, either select a new account or search for an existing one. For existing accounts, details about the lead appear in empty fields. If your company uses person accounts and the lead is an individual consumer, leave the Account Name field blank. If you update an existing person account, the option to overwrite the Lead Source field in the person account with the value from the lead. In the Opportunity Name field, enter a name for the new opportunity or select Do not create a new opportunity upon conversion. Optionally, schedule a follow-up task under Task Information. If your company doesn’t already have a standard naming convention for leads and opportunities, now’s a great time to implement one. Naming conventions help everyone work more efficiently, because users can more easily locate a deal and understand what each deal on a list is about. A naming convention for opportunities could include a standard method for using product names, new business, add-ons, and quantities. You can use Process Builder to automate the standardization of opportunity names. Or, if a user creates an opportunity by converting a lead, Salesforce appends the account name to the name of the new opportunity automatically. Now that you’ve converted your lead, you’re ready to work on the deal. Explore resources to help improve your lead conversion. Remember, this module is meant for Salesforce Classic. When you launch your hands-on org, switch to Salesforce Classic to complete this challenge.